How important is conflict resolution to you? What are you doing to prevent, manage and resolve conflict in your daily life…your neighborhood, community and throughout the world? Conflict resolution and peace building are important tools for effective communication in order to assure clarity and acknowledge the interests of all individuals in a dispute. These tools allow us to examine ourselves and the language we use in conflict. The impact of language in conflict affects us, the people around us and the diverse world we live in. In a special episode, The Language of Conflict, Kenneth Cloke will join us to share his thoughts, experiences and expertise about how our language can easily escalate conflict or if thoughtfully used can deescalate and expand our understanding of each other. Kenneth Cloke is a highly regarded conflict resolution professional and practitioner. His continuous work and personal journey through this field are important as he explores the ways in which to create a non-violent world. Cloke’s global work, teaching, research and overall knowledge has lead him to write numerous books on conflict resolution including his latest book The Dance of Opposites. This book focuses on a new vision for conflict resolution a “conflict revolution” that examines the language of conflict and how the brain responds to conflict. In addition he has authored and co-authored 11 books including Conflict Resolution-Mediating Evil, War, Injustice and Terrorism, The Crossroad of Conflict-A Journey Into the Heart of Dispute Resolution, and Resolving Conflicts at Work: Eight Strategies for Everyone on the Job. 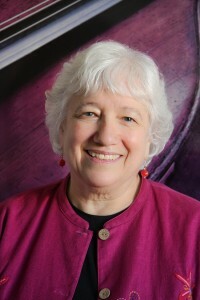 Cloke has served as mediator, arbitrator, attorney, coach, consultant and trainer and specializes in resolving community, grievance, workplace disputes, collective bargaining, organizational and school conflict, sexual harassment, discrimination lawsuits and public policy disputes. Most importantly he has taken his teachings and shared them around the world in Universities, colleges and other training programs at schools like Antioch University, Occidental College, Pepperdine University School of Law and Harvard University School of Law. Teaching in subjects such as; law, mediation, conflict studies, urban studies, political studies and other social sciences that can help create change in the community you live in. MMB also has current projects in Colombia, Israel, Kenya, Liberia and other places to promote and use conflict resolution as an effective tool for peace. Kenneth Cloke is the Director of Center for Dispute Resolution, which is a private center that offers a variety of services with a broad range of experience from multi-disciplinary professionals. The Center has been operating over 15 years. Kenneth Cloke is like many of us. He is dedicated to helping and creating change using effective tools for people all over the world. Remember any and every effort to resolve conflict non-violently makes a difference. To learn more about Kenneth Cloke, listen to the upcoming show, January 14th at 7pm CT The Language of Conflict. 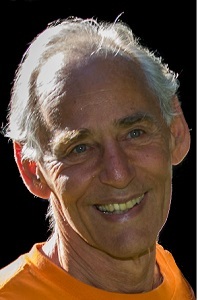 Ken Cloke is renowned for his decades of work, passion and dedication to bring peacemaking tools to wherever he believes he can be of service whether it is in the U.S. or around the world. In this episode, The Language of Conflict, Ken will share his personal journey into conflict resolution and peace-making and what keeps him here is this field. He will also share his philosophy of peace-making and what he believes can bring us closest to peace. His global work, research and teachings lead Ken to write numerous books including his most recent The Dance of Opposites which explores a new vision for conflict resolution and the use of language in conflict. Listeners will get an opportunity to think about how they might change their own language of conflict. In my first semester at University of Baltimore we were assigned a book to read called Difficult Conversations: How to Discuss What Matters Most by Douglas Stone, Bruce Patton, and Sheila Heen. The book provides a step-by-step approach to working through difficult conversations. The entire book was fantastic, but one particular section was eye opening for me. The chapter discusses how people need to stop blaming others and instead assess how they have contributed to the conflict. Stone, Patton, and Heen urge readers to ask themselves, “how did I contribute to this problem?” At this time in my life I was involved in a conflict with a friend and I was not taking any responsibility for my actions. 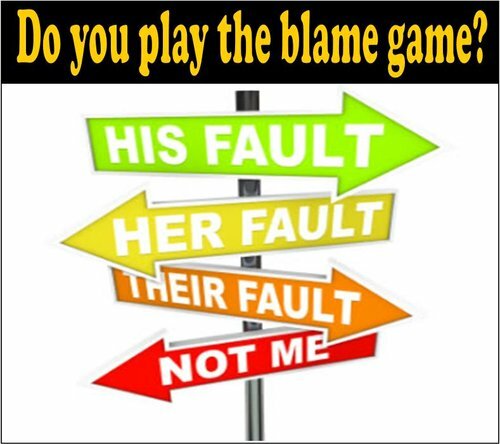 It was a huge breakthrough for me because I realized how often we blame others for the conflicts we face; we abandon ownership of our problems, but why? Perhaps because it is easier to throw up our hands and say, “I didn’t do anything wrong”, but this does not resolve conflicts, if anything it prolongs them. In any conflict you face, whether with a significant other, boss, or friend begin by taking a step back and asking yourself “How did I contribute to this problem?” Dr. Patty Ann Tublin a contributor to Entrepreneurial Woman explains, “Conflict in our relationships cannot be created in a vacuum. At least two people are responsible for it when it enters our lives. Regardless of whether you started the conflict or you are allowing it to perpetuate, you have some personal responsibility for its presence in your relationship.” Maybe your husband forgot to stop and pick up the items you requested for dinner at the store, he gets home and this starts a fight because now you have nothing to make for dinner. Ask yourself what you could have done differently? Maybe you could have sent a reminder to him so he wouldn’t forget. Even small squabbles such as this can build resentment, if both parties do not take ownership. Why do people avoid taking responsibility? In an excerpt from Kenneth Cloke and Joan Goldsmith’s book, The Art of Waking People Up: Cultivating Awareness and Authenticity at Work found on Mediate.com they explain that, “everyone in conflict tells a story in which they are right and the other person is wrong.” Cloke and Goldsmith suggests that, “These accusatory, self-serving stories are designed to disguise and divert attention from the role they play in keeping the conflict going, and reinforce their defenses, justifications, countermeasures, and irreconcilable positions.” Stone, Patton and Sheen point out “The urge to blame is based, quite literally, on a misunderstanding of what has given rise to the issues between you and the other person, and on the fear of being blamed.” People are not fond of admitting to their shortcomings. But the fact of the matter is, we are all human and we all make mistakes. It is easier to point the finger at someone else when things go wrong. And it takes courage and strength to own up to your part in any given issue and in doing so, it assists you and the person your in conflict with move forward. Why is taking ownership important? Jeff Durham a contributor to Life Coach Expert points out, “ taking responsibility for our actions equals success. It also makes us feel good about ourselves and rids us of negative personality traits such as anger, fear, resentment, hostility and doubt.” It is essential to recognize your contribution to the conflict in order to move towards resolution. 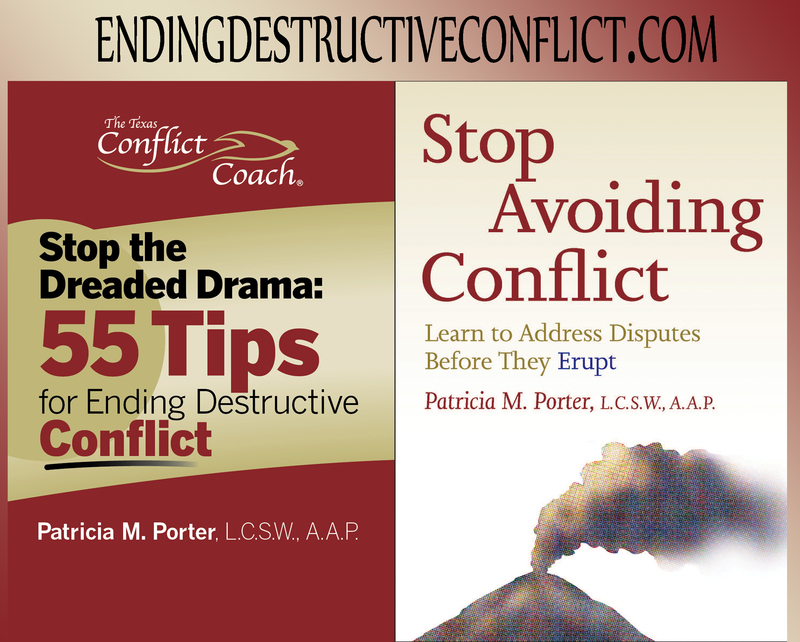 The other person in the conflict becomes more open to listening allowing both parties to see and understand why the conflict occurred, what improvements you need to make and how to prevent the problem from happening again. 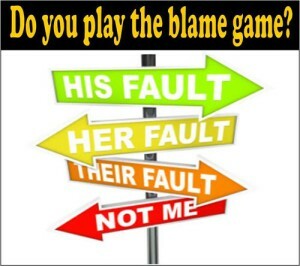 So, the next time you find yourself attacking or blaming others, stop, think and ask yourself “What did I do or say, however small, that contributed to the problem?” Refrain from justifications such as “I wouldn’t have done X, if they had not done Y.” And then, own it.